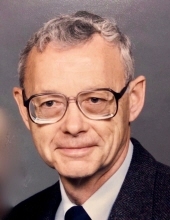 DRYDEN, James Ralph – age 86, of Hartland, died peacefully in his sleep Wednesday, January 9, 2019 at his home in Hartland, Michigan. Funeral Mass will be celebrated 10:30am Monday, January 14, 2019 at St. John the Baptist Catholic Church, 2099 N. Hacker Rd., Howell with Fr. Francis George celebrant. Interment will follow at New Calvary Catholic Cemetery, Flint. Visitation will be held on Sunday 1-3pm and 5-7pm at Sharp Funeral Homes, Fenton Chapel, 1000 W. Silver Lake Rd., Fenton where a rosary service will be held at 7pm. Visitation will also be held 9:30am – 10:30am Monday at the church. Memorial contributions may be made to the Cromaine Library of Hartland. Mr. Dryden was born June 12, 1932 in Flint, the son of Agatha Irene Lang and Arthur Storey Dryden. He married Lydia Anne Kilbourne on November 12, 1955. Mr. Dryden graduated from the University of Notre Dame in 1955 with a degree in accounting. He worked for General Motors and EDS as an Information Technology Account Manager until he retired in 1993. He then worked for H&R Block as a tax preparer until the age of 80. He helped to start the girls swim team at Flint Powers High School. He spent hundreds of hours driving and watching his children swim. He loved to play golf, run marathons, play handball and racquetball at the YMCA. James was an avid reader and instilled a love of reading in all his children when he took them to the Flushing library every week to check out books. He was a passionate Notre Dame fan and looked forward to every sporting event. He and Lydia have been members of the St. John the Baptist Catholic Church since 1986. Surviving are: six children, Michael Dryden of Groveland, CA, Catherine Dryden (Gerald Brouillette) of Albany, NY, Mary Dryden-Fakir (William El-Fakir) of Bellbrook, OH, Susan Dryden-Hogan of Hartland, MI, Nancy (Carl) Tatsuguchi of Grayslake, IL, Linda Schell of Big Lake, MN; 14 grandchildren, Michael Jay, David (Katie), Amber (Alan), Sarah, Jessica (Matt), James, William, Daniel (Melissa), Margaret, Christopher, Catherine, Nicole, Marie, and Benjamin; one great grandchild, Samuel and one on the way; and many more nieces and nephews. He was preceded in death by his wife Lydia Anne; parents; and two brothers David and Robert. Friends may share an online tribute on the obituary page of www.sharpfuneralhomes.com. To send flowers or a remembrance gift to the family of James Ralph Dryden, please visit our Tribute Store. "Email Address" would like to share the life celebration of James Ralph Dryden. Click on the "link" to go to share a favorite memory or leave a condolence message for the family.